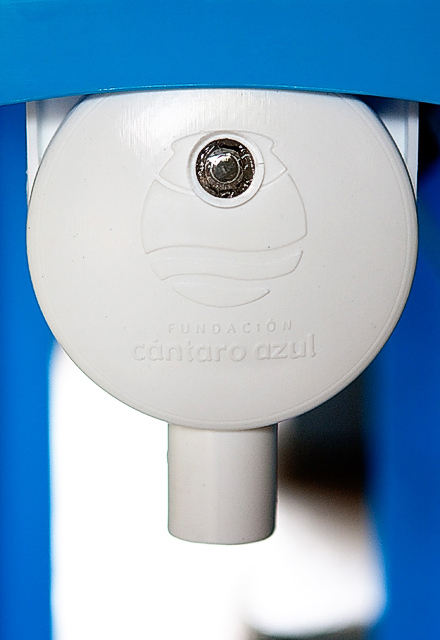 The Mesita Azul® is an innovative water disinfection system that uses ultraviolet light, designed and developed by Cantaro Azul in collaboration with the University of California, Berkeley. The Mesita Azul® inactivates bacteria, viruses, and protozoa with a flow rate of five liters per minute, without changing the physicochemical properties of the water such as taste and temperature. The Mesita Azul® delivers a high germicidal dose that meets the Highly Effective disinfection standard established by the World Health Organization. This safety margin guarantees the effectiveness of the system even when it is operated under non-ideal conditions. Laboratory tests carried out by the Mexican Institute of Water Technology confirm that the Mesita Azul® meets the official standard set by the Secretary of Health for point of use disinfection systems. The Mesita Azul® is one of the few technologies designed directly with the participation of marginalized communities, particularly women, which allowed for greater emphasis on its aesthetic and user-friendly qualities. The Mesita Azul®'s success in households, schools, and community kiosks has expanded our capacity to offer effective, appropriate, and sustainable safe drinking water solutions to more regions of Mexico and the world. Visit our Map to get to know where we have implemented Mesita Azul® programs.